The weather had finally turned for the better in Tokyo so it was time to go explore some more. Chris had headed over to Ebisu to get some designer jeans and the plan was to meet up in near-by Harajuku for lunch. I made the now routine trek to the metro station and boarded for the short trip. Unfortunately, I realized too late that this particular train wasn’t stopping in Harajuku so I had to go to Shibuya station and then schlep over to the other side of the station to catch the train going to Harajuku. That put me a bit behind schedule by the time I got to the station but fortunately the restaurant wasn’t too far away. I had read about the pancake trend in Tokyo and while the hot spot was Eggs N Things that was actually a Hawaiian chain so I wanted something more Japanese. Enter Pancake Days. I made my way down a series of cute alleyways that felt more European than Japanese and soon arrived at Pancake Days. 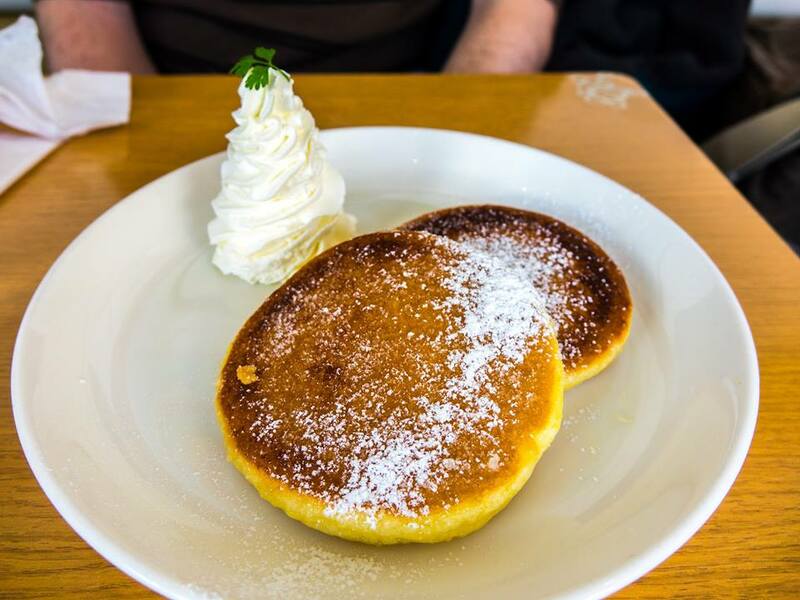 As the name implies, the restaurant is all about pancakes – both savory and sweet. It was the former that had led me there as I had never had a savory pancake. Located on the second floor, there was a small line out the door but since Chris was running late, it wasn’t a big deal. Plus, in the meantime, I got to watch the chef make pancakes behind the glass. One thing that was immediately clear was that I was a bit of an odd presence there. Not only was I the only gaijin. I was the only male and the oldest person by probably 20 years. Surrounded by girls in their school uniforms and slightly older teenage girls, I felt a bit like a perv but hey, guys like pancakes too! There was no English menu but the pictures were pretty clear. I had also read about a specific croque monsieur pancake so I knew what to look for on it, and hey, it came with smiley face potatoes. Essentially a riff of the famous French sandwich, this version used the pancakes as the bread, with layers of ham between and then a Bechamel sauce poured over the top. It was delicious. The pancakes were light and fluffy, and devoid of the usual butter/syrup, worked perfectly as a savory vessel. It was good enough that I wanted to see what a sweet version tasted like. I saw what appeared to crème brulee and comically failed in my attempt to ask if that’s what it was. My server fetched someone who at least understood English and sure enough that’s what it was. Chris soon after arrived and opted for the maple cream pancakes. A few minutes later my pancakes arrived. The top of the pancakes were indeed bruleed and had that great crunch on top. The pancakes had been sweetened with vanilla and there was a chantilly whipped cream on the side. Outstanding. After lunch, we headed into Harajuku, which is one of the main shopping areas in Tokyo. There were two very distinct parts. The main street was lined with the usual high-end stores, including a very fancy indoor mall. On the outskirts of this were a series of smaller streets where the more hip and trendy boutiques were located. While not Sunday, which is the primary people watching day there, the mix of urbanites and hipsters was amusing. 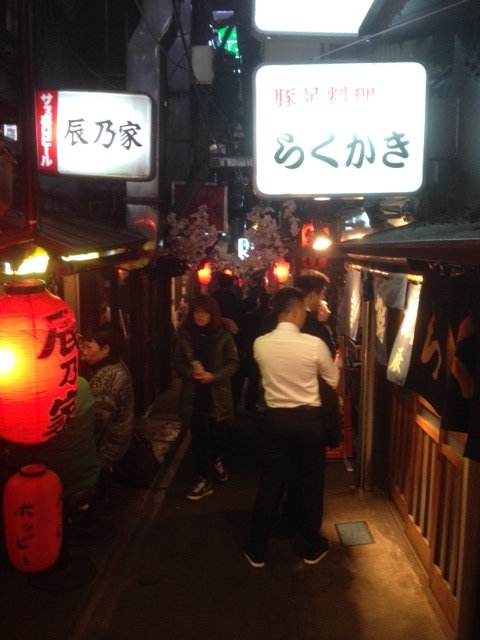 The plan for that night was to finally hit the lovely named Piss Alley, which is basically the food equivalent of the Golden Gai, and then to go to a “shot bar” that specialized in Japanese whisky. Unfortunately, Chris was down for the count so I decided to fly solo. Piss Alley isn’t exactly easy to find as it turned out even with its proximity to Shinjuku. After a few failed attempts, I found a kind older man who was helping out another tourist who funny enough were looking for Robot Restaurant. After he was done with them, I asked him for directions. He said he would show me and walked me over to where the entrance was, exclaiming “I have to get home soon!” He had made a vow long ago to help any tourist who was lost but I was the last one for tonight. The entrance was pretty much how I pictured it would be. The smell of the various grills made my mouth water and in a daze, I headed down one of the streets packed to the gills with people munching on meat and other things on sticks. With no real set location in mind, I ended up picking one that had an empty seat and was exposed to the open air since it was such a nice night. 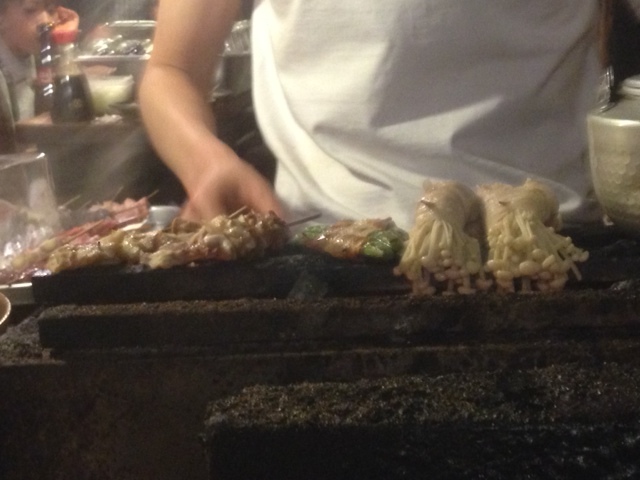 The youngish man in charge of the grill asked me if I can eat pork (Can I?!?) and I took a seat at the end of the counter. I was right in front of the charcoal grill so I watched for awhile as he tended to various pork goodness on a stick, mesmerized by his skill at expertly turning them at just the right time. There was no menu but rather a large plate with all of the things they would cook – from pork loin to innards to vegetables wrapped in bacon. I started out with 2 sticks of pork, which were perfectly seasoned and fantastic. 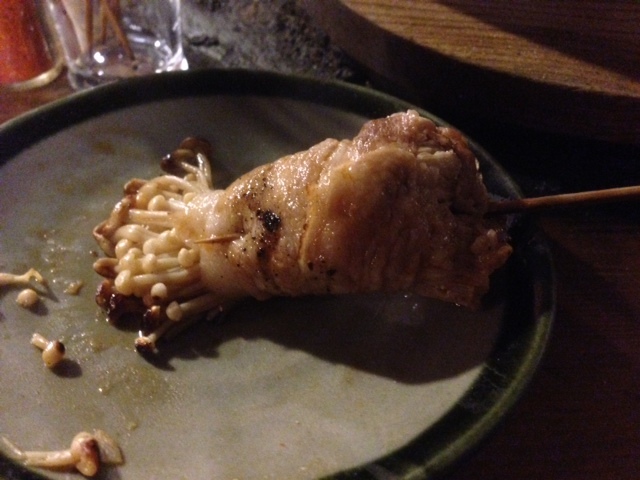 Next I went with a bunch of enoki mushroom that were bundled together with a strip of bacon. For this one, he first dunked the mushrooms in a large cauldron of pork stock for a couple of minutes before adding them to the grill. 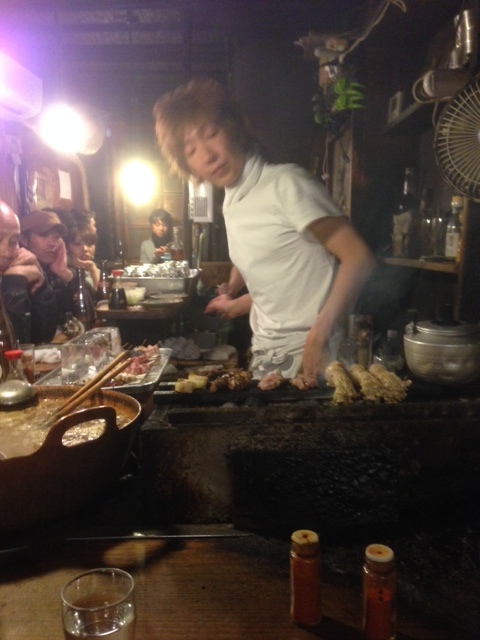 At the last moment, he brushed some soy sauce on and then kissed it back on the grill. With just a stick as my only utensil, it proved at first to be a bit challenging to eat as it was a ton of mushroom stems to chew threw. Eventually I figured out to treat it like it were ramen noodles, unwrapping the bacon and slurping them up. They may have been the single best thing I’ve had on my trip so far – incredible. 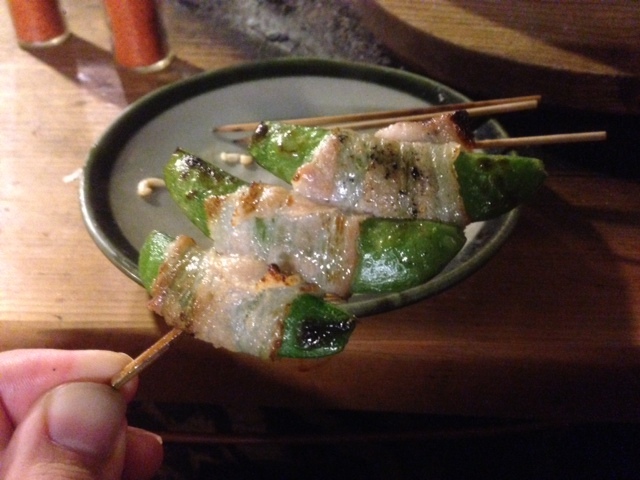 I ended with another veggie wrapped in bacon – green beans this time. No dunking required for this, just a quick grill followed by the soy and kiss back on the grill. The green beans were wonderfully crispy and the bacon added the right amount of salt to the smoky flavor overall. As a lover of yakitori, this was as good as it gets. A mere $13 for the whole thing to boot. The next challenge was to figure out how to get to the whisky bar. I had a very crude map from their site but this turned out to be almost useless as none of the markers were in English. I wandered around for a good half hour before Google Maps finally started to play nice and tell me that I was a mere 92 feet away. Thankfully, I recongized the eye logo as there was nothing indicating it was called Zoetrope. I took the elevator to the fourth floor and walked through the ornate gold door. The owner was dressed in a Hawaiian shirt and welcomed me to sit down after informing of the cover charge and lack of credit cards. I had come with plenty of cash so this wasn’t a big deal. 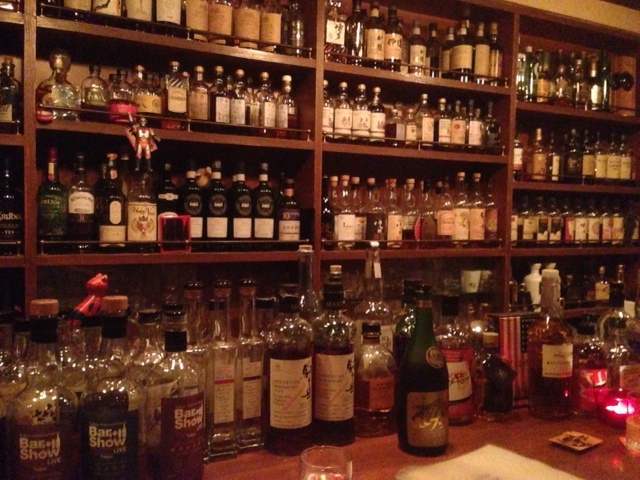 The bar had over 300 Japanese whisky by the shot as well as a few tasting options. 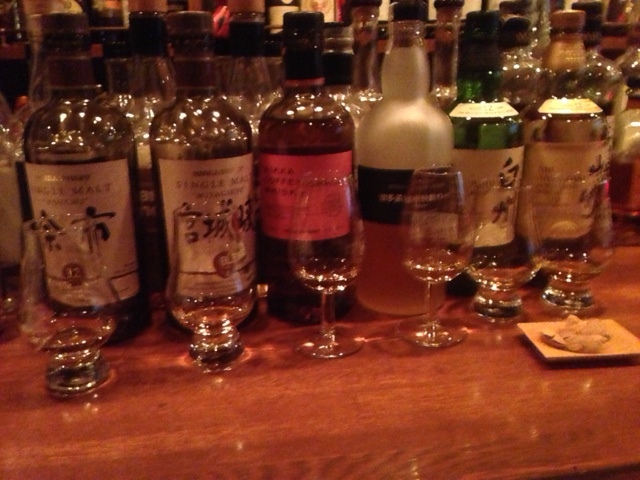 I opted for the intriguingly named Suntory vs. Nikka Single Malt tasting. He began to set up the tasting and explained how Nikka was a relatively new distillery that had just started distribution in the US. I was to start with the Suntory ones first, which included the familiar 12 year The Yamazaki along with 2 I had never had. The latter two were by far the most interesting, especially the last one which was a single grain whisky – basically their equivalent of a rye whisky. I then proceeded to the Nikka ones. The first one was similar to the last Suntory in that it was also a single grain except this one was a cofee grain. It had a very clean and potent taste, with more pronounced alcohol profile than the Suntory counterpart. The next two were the real winners though. The first, called Miyagiko had a wonderful smoky flavor but not overpoweringly so. It was then that I realized the owner had purposefully made me try the Nikka ones last as he clearly preferred them. He smiled and admitted that was the case. The final one Yoichi had a slightly sweeter taste but was also excellent. I decided to get one full shot as a nightcap and since we had been discussing our mutual love for Kentucky single barrel bourbon, he suggested I try a bottle made specifically for his 3rd anniversary, which was a whisky blend that had been finished in rum barrels. It did indeed taste a lot like a good Kentucky bourbon and was a great way to end the night. I said my goodbyes to the salary men in the corner and the French couple who I had insisted try Midori Sushi the next day. Tomorrow was the last hurrah in Tokyo and I intended to go out in style. Posted on April 8, 2014 by reyalto. Bookmark the permalink.